When the Italian immigrants first arrived they found the Catholic Churches controlled by Irish Priests and Bishops. Nothing wrong with that of course, but in those days many of these Priests were hostile towards the brand of Catholicism the Italians practiced. To the Irish Catholics the religious practices of the Italian immigrants were more like those of a fold religion with a mix of superstition and worship. The long street processions led by a marching band, with the faithful carrying statues of The Madonna and a whole array of Saints laden with dollar bills, followed by praying chanting parishioners holding candles seemed more like pagan rituals than Catholic Practices. To the Italians on the other hand, a religious holy day was an occasion of joy, a cause for dancing, singing and celebration, as much as it was a day of prayer. The Italians formed a committee to raise funds for a little Chapel on Brayton Street, near the centre of a small Italian Colony and they joyfully celebrated their first Mass on Septermber 22nd 1889. 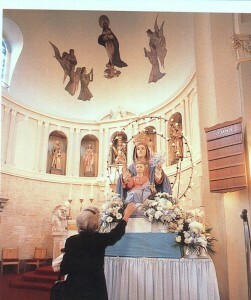 The Italian Churches were now born in Rhode Island and rapidly spread from community to community. The story of the Italian Parishes in Rhode Island may very in some detail, but today, even where there are fewer processions and where Masses are no longer said in Italian, the customs and religious celebrations continue. Each Parish still commemorates the Feast of its Patron Saint in a special way as the descendants of the early immigrants remember their past.